This FULL YEAR set of six GEOMETRY programs (plus a 7th program - "Coordinate Geometry") is a full year curriculum of High School Geometry. 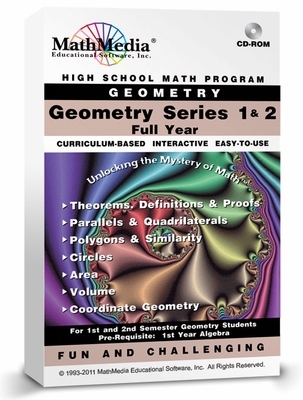 Topics covered are traditional to all textbooks used in classrooms everywhere. Topics are accessible by MENU and navigation through these programs is easy. A 7th program, "Coordinate Geometry", will be included, when the full year set of six programs is purchased. Purchase the full year version of seven programs with LMS (Learning Management System) functionality for $299 or each individual title for $49 each.